Have you ever had the experience where you’re playing your guitar and it sounds great one day, but the next day it just didn’t sound anywhere close to the day before? While this may have happened to you because you just weren’t in the mood today, the more likely cause is the change in humidity in your environment. Depending on where you live, humidity can be either a minor issue that doesn’t really affect you or your instrument or a major issue that can cause serious damage to your instrument. 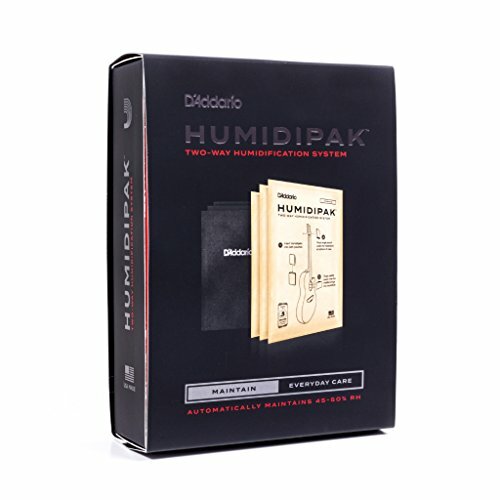 No matter what your situation may be, humidity is something is always around and if you’re concerned about taking care of your instrument, you should have the humidity in the room you’re storing your instrument in under control. Your instrument is comprised mainly of wood and wood is extremely susceptible to any moisture, which can impact your guitar in several ways. This is where guitar humidifiers come into play! If you keep your guitar properly humidified, you’re not going to have any problems with your guitar (related to humidity). The best part is, if you don’t have to pay an arm and a leg for a good quality humidifier. Having a high-quality humidifier with you is just as important as having a good tuner and a good set of strings with you. Matter of fact, a humidifier of quality is one of the most important factors of keeping your guitar in the best shape possible. While this probably isn’t the most exciting topic to talk about, it is an important topic to learn about, especially if you are someone who leaves their acoustic guitar in an environment that isn’t great for your guitar, as it can leave your instrument with a warped neck, cracks in your body, frets that buzz, and other horrible things. These problems can be especially evident during the cooler months, especially when heating systems tend to dry out homes. Whenever your homes begin to dry out, this means that your stringed instruments are also going to dry out. While there are a lot of different accessories that you can purchase for your instrument on the market, there is a great variety of humidifiers on the market that all accomplish the same exact thing, which is to keep the wood in your guitar properly humid. You can use a hygrometer to measure the amount of humidity in a room, which should be between 40%-50%. There are some hygrometers that have sensors that will tell you what the humidity is inside of your case. If your instrument is already dried out and damaged, there really isn’t anything that these devices can do for your instrument. When using your humidifier, you should only be using distilled water, because regular tap water contains traces of chlorine and minerals, which aren’t good for the humidifier or your guitar itself. While you may be unsure about spending $15 on a gallon of distilled water, be aware that the gallon of water will get you far when using it for your humidifier. How do I know I need a guitar humidifier? The best way to figure out whether or not humidity is a problem for your instrument is to purchase a hygrometer and test out the humidity levels in your guitar room. Personally, I would recommend the Oasis OH-2 Digital Hydrometer with a full clip, because it’s a convenient hygrometer to use that’s pretty accurate and readily affordable, guaranteed for five full years. The Oasis OH-2 Digital Hygrometer come with an incredibly slim profile that has a secure Velcro mount that can fit just about anywhere. There is an advanced humidity sensor that’s in the Oasis OH-2 Digital Hygrometer that’ll ensure accuracy for years to come. Once you turn on your hygrometer, your humidity should be between 40%-50%! What’s wrong with too much humidity? While a little bit of humidity will only bring around minor damages, if you aren’t a progressive path to keeping your humidity levels under control, it can bring around major damage to your guitar that can be completely irreversible. When humidity levels drop under 35% for your guitar, your frets are going to start feeling sharper, your guitar action changes and the top of your instrument will flatten out a little bit. Going down a step, if the humidity levels drop below 25% your frets are going to start feeling incredibly sharp, your playability levels are going to decrease, the finish of your instrument is going to sink, and there’s going to be a bit of a separation between the top of the instrument and the bridge of the guitar. However, if your instrument is exposed for long periods of time to humidity levels under 15%, you’re going to have to get yourself a new guitar. Once exposed to 15% humidity for a period of time (sometimes, only up to a month if your guitar is used to more humid levels) you’re going to start seeing visible cracks on the bridge, body, fingerboard, and all of the joints are going to start separating. This damage is completely irreversible and if this happens, you should take your guitar to a pro shop to see if your guitar can be salvaged. When you consider that you get yourself a humidifier for as low as $5, it really doesn’t make much sense to expose your guitar to the dangers that come when not exposing your guitar to proper humidity levels. In the end, the cost of your guitar will be much greater than the cost of a humidifier. Does a dry environment create a great guitar sound? Sadly, this is a huge myth that a lot of guitarists tend to believe in the guitar realm, but please know, that this could not be further from the truth. While natural aging for your guitar causes hardening of the instrument, as well as cell crystallization, which results in a louder and more dynamically contrasting sound, this doesn’t have anything to do with the dryness of the environment that you’re resting your guitar in. Keeping your instrument in a dry environment will only cause more damage to your guitar, which means that you’ll have to shell out loads of money to pay for structural repairs for the instrument. Guitar humidifiers will only set you back a couple of bucks, but if you don’t use a guitar humidifier, the ultimate cost of all of the damage on your guitar could make you shell out thousands of dollars in structural repairs. What’s worse for my guitar- hot or cold? Another frequently asked question is, is it worse to leave your guitar in a hot environment or a cold environment? In one situation, excessive heat can cause the glue on your joints to fail, so your guitar basically falls apart. On the other hand, a cold environment can cause the finish of your guitar to become damaged. Your guitar will begin to develop cracks in it, which can ruin the cosmetic appearance of your guitar, but if exposed to the cold long enough, it can damage the sound of your instrument too. Are humidifiers for acoustic guitars only? Actually, guitar humidifier isn’t only for acoustic guitars! In general, acoustic guitars are much more fragile and sensitive to humidity changes, which is why we strongly recommend that you get a humidifier if you have an acoustic guitar. However, that doesn’t mean that electric guitars are safe from humidity changes either. In the more recent years of production, a lot of instruments have been crafted with kiln-dried wood, whereas vintage guitars were crafted with air-dried wood. Kiln dried wood uses heat to dry the wood, which accelerates the aging process. This means that when purchasing your guitar, you’re really going to want to make sure that you get yourself a humidifier, as instruments crafted with kiln dried wood are more prone to cracking and splitting. Properly humidifying your instrument is the only real way that you can get ahead of the damage that can be caused to your guitar. Vintage guitars are less likely to have damage caused by them when not properly taken care of (with humidity levels) because they’ve been air dried. What should I look for when buying a guitar humidifier? When purchasing yourself a humidifier, you’re more than likely going to purchase either a sound hole humidifier or a guitar case humidifier, as these are the two most popular humidifier models on the market. A sound hole humidifier is the most popular choice of the two; the sound hole humidifier covers the sound hole of your instrument or it sits between the strings of the guitar. A guitar case humidifier sits in the case of the guitar and can be typically found underneath the headstock of the guitar. How much money should I spend on a guitar humidifier? Firstly, it’s incredibly important that you get yourself a good hygrometer in order for you to know the humidity levels in your guitar room. If you’re interested in purchasing a sound hole humidity or a guitar case humidifier, you should only spend around $20. 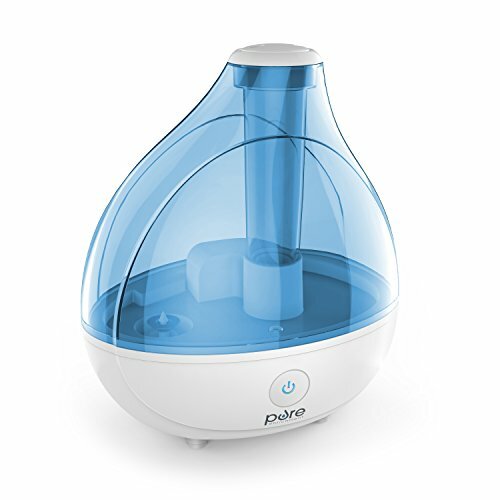 You can get yourself a room humidifier for no more than $40; in the long run, you should be spending around $50 for a humidifier, but don’t ever spend more than $100 on a singular humidifier. What are the different types of guitar humidifiers? But, which humidifier is the best for me? That really all depends on how you use your guitar. If your guitar spends most of its time up on a wall or on a stand in your room, you’re going to want to get yourself a room humidifier. On the other hand, if it spends a lot of time in a case, get yourself a sound hole humidifier or a guitar case humidifier. However, it does get a little bit trickier from there. Storing your guitar up on a wall for a long period of time isn’t good for your instrument, as it can expose your guitar to dust, debris, and other elements that can hurt your instrument. In our opinion, the best place to store your guitar is in a hard case. The safest place to store your guitar is in a hard shell case, as it not only offers protection from dangerous elements, but it also provides a place to use a high-quality humidifier that will keep your guitar in prime shape. 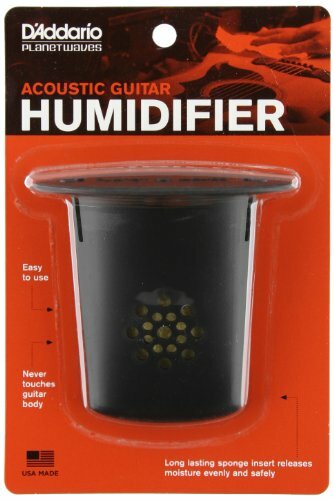 Sound hole humidifiers tend to be the biggest choice for acoustic guitar players, as they are typically simple to use. Sound hold humidifiers are on the cheaper side of the spectrum, because they don’t really add any humidity to a guitar case or to an entire room, but just to your acoustic guitar. Soundhole humidifiers have been created to fit entirely into the sound hole or to attach to the strings of the instrument. The Humitar fits inside the sound hole of your instrument while keeping a low profile that it’s too distracting or too in the way so that you’re able to close the lid of your guitar case. There is a synthetic sponge that comes with the Humitar that holds more water than a typical sponge that comes with any humidifier and this sponge comes with Anti-Drip technology. This is also a single time purchase, so you’re not going to need to worry about purchasing any replacement packs for this humidifier. However, like any humidifier that fits into the sound hole of a guitar, it can be a bit difficult to fit into the sound hole, so you may have to spend some time finessing the humidifier into the sound hole. Like all other humidifiers for your guitar, you should only use distilled water with the Humitar. 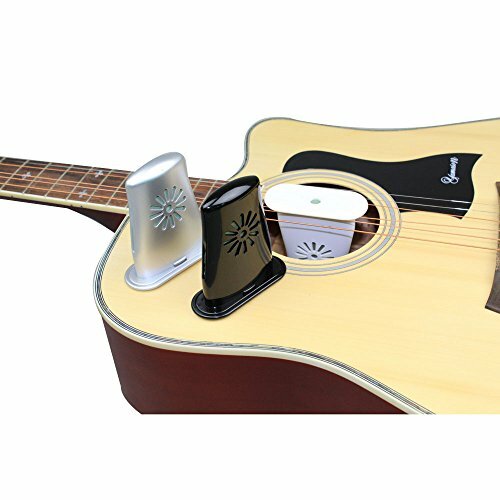 The Kyser Lifeguard Humidifier is great to use if you happen to keep your guitar on a stand, as it covers the entire side of the sound hole which allows the humidifier to keep the moisture circulating inside of the body, whereas other guitar humidifiers leave a lot of the moisture inside of the sound hole. It’s very neat, as it fits in the sound hole very snuggly. However, it can be fiddly whenever you add more water to the humidifier and you may experience problems fitting this humidifier into the guitar’s sound hole if you have a sound hole that’s uncommonly shaped. These humidifiers add moisture to the entire guitar case, so we suggest that you use a hard case if you’re going to use this humidifier, as the hard case not only protects your guitar, but it will also help to keep some moisture inside the case. A soft case just won’t retain the moisture as well. 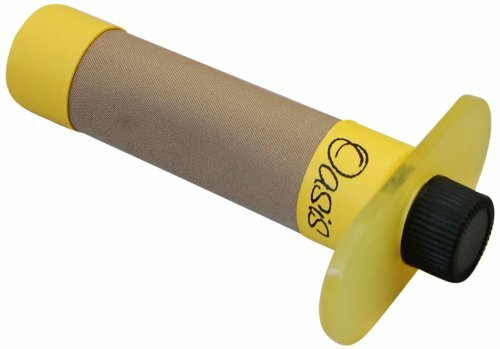 If you tend to be someone who keeps your instrument in your guitar case most of the time, the Oasis Instrument Humidifier will take care your instrument while it’s in the case. If you happen to live in a really dry climate, the Oasis can give you an extra 10% level of humidity compared to the 40%-50% that’s normally found with other guitar humidifiers. This humidifier automatically collapses when it needs more water, so it’s very obvious when you need to add more water to your humidifier. There is also a magnetic strip and metal clip that fit into the side of your case, which makes it easy to safely be able to insert your humidifier into the case. You’ve just really got to make sure to leave this in your case so that it will work properly. The biggest downside to this humidifier is that it can dry out relatively quickly, so you really have to stay on top of making sure that you keep water in the humidifier. The D’addario Two Way Humidification Systrem is the very first two way humidity system that controls a constant 45%-50% relative humidity level within your guitar case. With this humidification system, you’re not really going to have to worry about making a lot of manual adjustments based upon the changes in seasonal weather or if you happen to move. You can use a room humidifier to keep your guitar in the proper climate, as the room humidifier keeps the entire room that your guitar is held in at a nice, steady level of humidity. A room humidifier is great to use if you are looking to keep a guitar or even several guitars hanging on a wall. 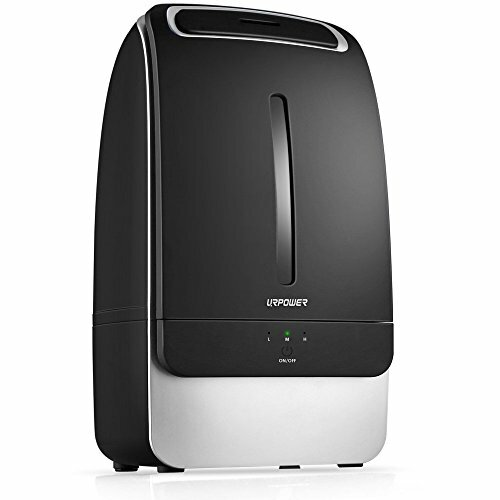 This is an extremely durable room humidifier that is perfect for smaller sized to medium sized rooms, which can add moisture to your room for up to sixteen continuous hours. This humidifier has a one and a half liter tank for the water it needs to provide enough moisture to humidity rooms that are the size of bedrooms or an office. If you happen to share a room with your guitar, this room humidifier also comes with a night light (that’s optional to turn on) to offer nighttime relaxation. How do I use a guitar humidifier? If you don’t use a guitar humidifier properly, or you happen to forget to use it, you can end up causing problems for your instrument. Basically, you’re going to want to make sure that you’re using a damp sponge to keep your humidifier with a supply of water. Make sure that this sponge isn’t dripping wet, so it’s just more of a damp sponge. You don’t want your sponge to be dry, but make sure that you’re not getting enough water on your sponge to make the inside of your guitar wet. The point of a humidifier is just to have gentle rehydration of your instrument, nothing too intense. Keep in mind that no two environments are the exact same, so make sure that you’re monitoring your humidifier to see when it needs to be renewed with more water. 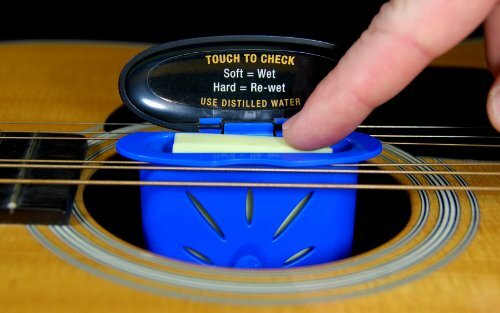 You shouldn’t have to re-wet your sponge every day, as that can make the guitar or room too wet and too humid. You should only need to dampen the sponge for your humidifier once a week. Take extra care to ensure that you’re not leaving your humidifier laying down flat on your instrument, especially for any tube style humidifiers, because they can fall into the sound hole of the guitar easily. If you happen to be using a humidifier to add moisture to your entire case and not just your guitar, make sure that the humidifier isn’t directly touching with your guitar. If you haven’t already, get yourself a hygrometer so you can correctly monitor your humidity levels. It’s very important that you know where you’re at with humidity levels, so you can properly adjust your humidifier. You should be keeping track of the humidity in your guitar, your guitar case, and your guitar room. When you measure your guitar case, especially hard shell cases, you’re going to see a different amount of humidity when compared to the measurement of the rest of the room. Closely monitor your humidity levels because just as there’s too little humidity, there’s also something as too much humidity for your guitar. A lot of other guitarists may make guitar humidifiers seem to be something optional that you could consider purchasing for your guitar. However, a guitar humidifier is something that you need to purchase for your guitar, especially since they’re so cheap. Guitar humidifiers keep your instrument in the proper shape and it’s one of those investments that will most likely save you hundreds, if not thousands of dollars. Which guitar humidifier do we recommend? All of these humidifiers have their own strengths and weaknesses, but you can’t really go wrong by choosing from any of the humidifiers we have listed above. The most important thing for you to remember is to get yourself a guitar humidifier before it’s too late! Tremolo vs Vibrato– What’s the Difference on These Two Techniques?